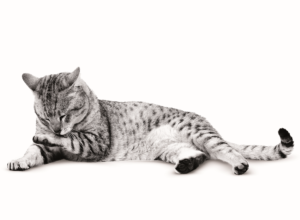 Home » Articles » What Are the Signs of Cat Pregnancy? Perhaps the most important piece of advice we can give is that if you think your cat might be pregnant, take her to the vet who should be able to confirm whether or not this is the case. However, if you’re looking for signs your cat might be pregnant here are some things to look for. Pregnant cats often exhibit morning sickness much like humans – frequent sickness could be a sign of illness, or if she is pregnant then signs of a complication. The stomach area will start to swell – there are other possible reasons for swelling in this area, so consult your vet if you are concerned. Later in the pregnancy, you’ll see an increase in appetite. Your cat will also likely put on 1 to 2 kg of weight. She may start to act more maternal, looking for extra fuss and attention from you and purring more. We hope this helped to answer your question about cat pregnancy. If you have any other questions about cats, be it breeding, raising kittens, or any other general cat queries, then we’d like to help. Submit your question below.